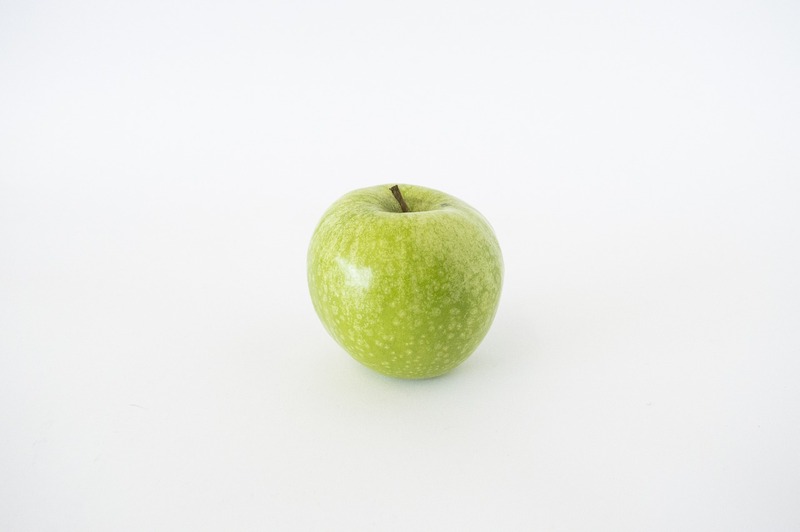 When you think of health, you’re most certainly going to think of an apple- and not a quarter pounder. This is because society subconsciously knows meat isn’t good for you, but not exactly how fatal science proves it to be. 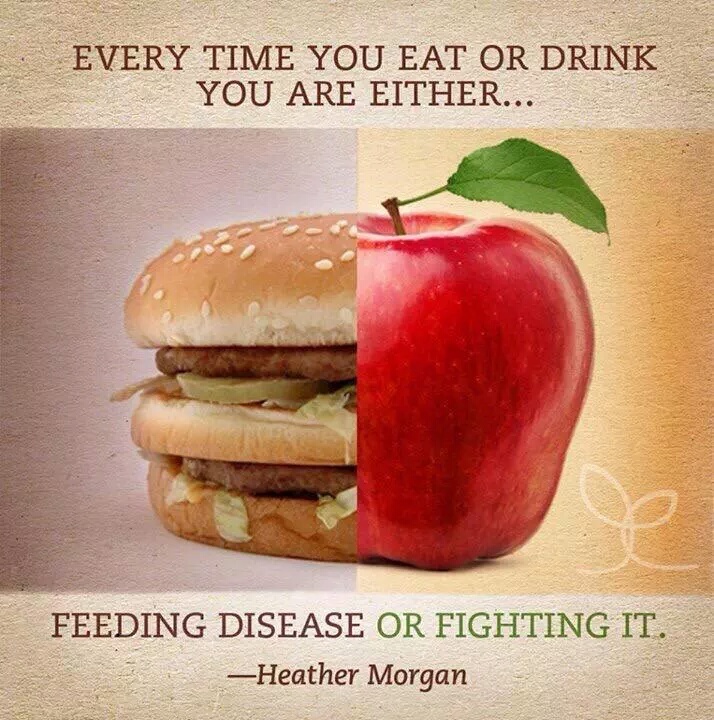 Take a moment to compare the potential consequences of your dietary decisions. You could choose to eat lots of B-12 rich animal foods and avoid the one-in-a-million chance of developing a reverse anemia… However, this decision puts you at a one-in-two chance of dying prematurely of a heart attack or stroke; a one-in-seven risk of breast cancer or a one-in-six risk of prostate cancer. The same thinking results in obesity, diabetes, osteoporosis, constipation, indigestion and a arthritis. As we get older and learn to think for ourselves, we begin to realize that we’ve been fed lies. That Got Milk™ was propaganda. 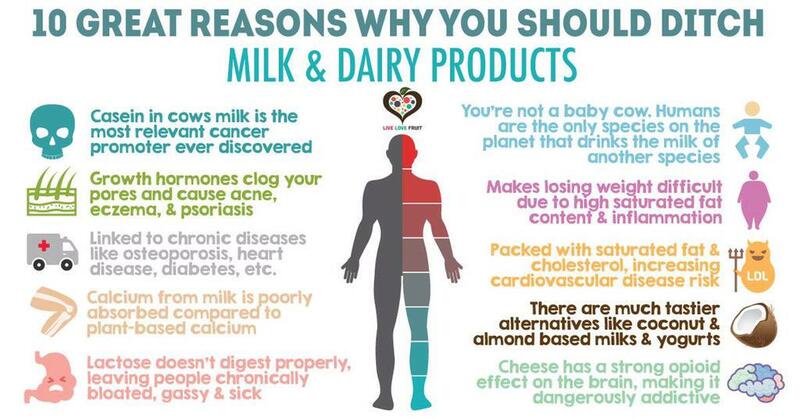 Almond milk has 50% more calcium than cows milk, and cows milk depletes your bones calcium causing osteoporosis over time. That one egg contains 186mg of cholesterol each and 3/4 the cancer promotion as a cigarette and hot dogs are scientifically linked with leukemia. Dietary fat of animal origin is linked to pancreatic cancer. For every 1% percent reduction in your LDL cholesterol level, your risk of coronary heart disease drops by 2% percent. *Note: plant based foods contain 0mg cholesterol and the fiber that it has (that animal products don’t) helps remove excess cholesterol from your digestive tract. Neu5Gc is found only in animal meat. 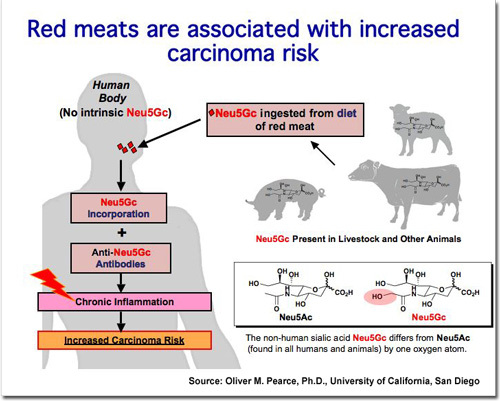 Neu5Gc appears to have a strong link to cancer and heart disease. Cardiovascular disease is the number one health problem in the U.S., accounting for nearly 1 million heart attacks annually and 2,150 deaths each day. That’s every 1 in 3 deaths. Top 15 foods for advanced glycation end products (AGEs) are all meat sourced with roasted BBQ chicken skin and fried bacon being the top. Arachidonic acid (naturally found in animal foods) is linked to brain inflammation, depression, anxiety, and stress. Chicken and eggs are the top sources and we already naturally produce enough for us to survive. The American Dietetic Association notes that a vegetarian diet reduces the risk of many chronic degenerative diseases and conditions, including heart disease, cancer, obesity, hypertension, and diabetesmen. Eggs are not healthy, nutritious, or safe. Significant levels of bacterial toxins are found in animal products that cause endotoxemia (bacterial toxins in the bloodstream) within hours of eating. They can survive heat, acid (and stomach acid) and digestive enzymes. They also have a strong affinity for our fat transport. One of the largest studies on lifestyle and health found that heart disease mortality rates for lacto-ovo-vegetarian males was only one-third that of meat-eating men. Source: R.L. Phillips et al., “Coronary Heart Disease Mortality Among Seventh-Day Adventists With Differing Dietary Habits: A Preliminary Report,” American Journal of Clinical Nutrition 31 (1978): S191-8. Feeding of cow brains to fish is still legal in the United States (and they can catch mad cow disease). Hormone Growth Promoters Fed to Beef Cattle Linked to Adverse Impacts on Male Sexual Development. The British Medical Journal published findings from a study concluding that lifelong vegans have a 57 percent reduced risk of death from heart disease. Meat has little to no antioxidants. Most can’t beat iceberg lettuce. A vegan diet can even reverse damage already done. When Dr. Dean Ornish put patients with coronary artery disease on a low-fat vegan diet combined with moderate exercise and relaxation techniques, he found that they reversed the buildup of plaque in their arteries. * Turkey was the most common with 77% and chicken and pork with 41% and 42%, respectively. A superbug version (methicillin resistant) was also found of MRSA that can jump from pig to human. More red meat, more mortality. Eating meat just a few times a month greatly increases the chances of abdominal aortic aneurysm that will result in a 15% chance to live. A study by the ACS found that people who ate 3 ounces of meat a day were 30 to 40 percent more likely to develop colon cancer. Source: Jessica Heslam, “Don’t Have a Cow, Man: Docs: Meat Hikes Cancer Risk by up to 50 Percent,” Boston Herald 12 Jan. 2005. Putrescine has been determined to be carcinogenic. Putrescine is found in food even when not spoiled. Highest level in canned tuna, and humans can only detox 50% of carcinogens in meat. Source: Food Research International, Current Nutrition & Food Science Food Chem. Meat and cheese consumption linked to earlier death. * Y. enterocolitica usually causes bloody diarrhea and can have very harmful long-term effects if left untreated. Half of American pig herds were found to be infected. 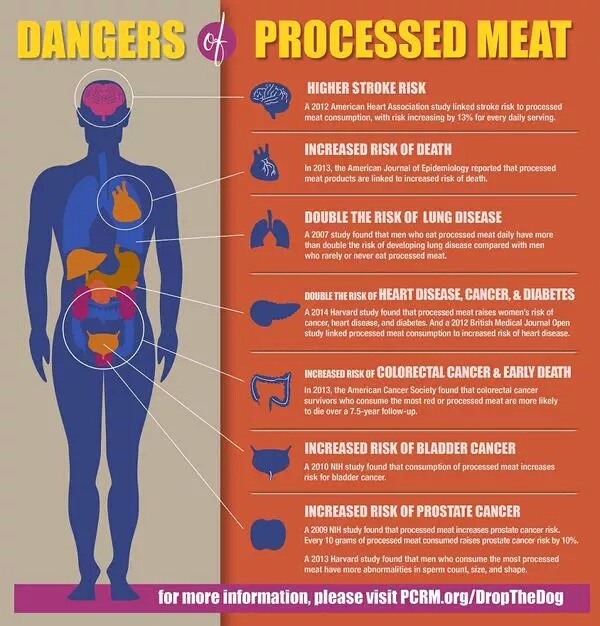 Researchers for the National Cancer Institute have found that eating meat raises men’s risk of prostate cancer, while a study from Yale University reports that meat-based diets can cause cancers of the stomach and esophagus, as well as lymphoma (cancer of the lymphatic system). * Top 5 saturated fat sources include cheese, pizza, pastries, ice cream, and chicken. Low or no meat consumption also decreases your risk of mortality from degenerative disease, and increases your life expectancy. Poultry consumption is associated with an increase in lymphoma (blood cancer). Pink Slime, which makes up 25% or more of your beef. Cured meat seems to increase the chance of getting chronic obstructive pulmonary disease (COPD) the third leading cause of death. * IGF-1 has been shown to promote cancer growth. Fish flesh is also not a healthy food. Polychlorinated biphenyls (PCBs), residual industrial compounds that can be found in the environment, have caused cancer in animals and skin problems and liver damage in humans. It has also been found to harbor levels of PCBs thousands of times higher than those in the water in which they live. Pork tapeworm brain infection is the most common parasitic disease in the brain for people and is on the rise for humans in the United States. A major 2006 study of 135,000 people found that those who frequently ate grilled skinless chicken had a staggering 52 percent higher risk of bladder cancer than people who never ate it. Vegan diet reverses diabetes symptoms, study finds. hIP stimulates breast cancer cells to invade healthy cells more so than the hormone estrogen itself. Even when PhIP is at low concentrations. * PhIP is most common in chicken, beef, and fish. Next Post Angora Wool: what is it and what you can do? Previous Post Vegan While Chronically Ill: It Is Possible!